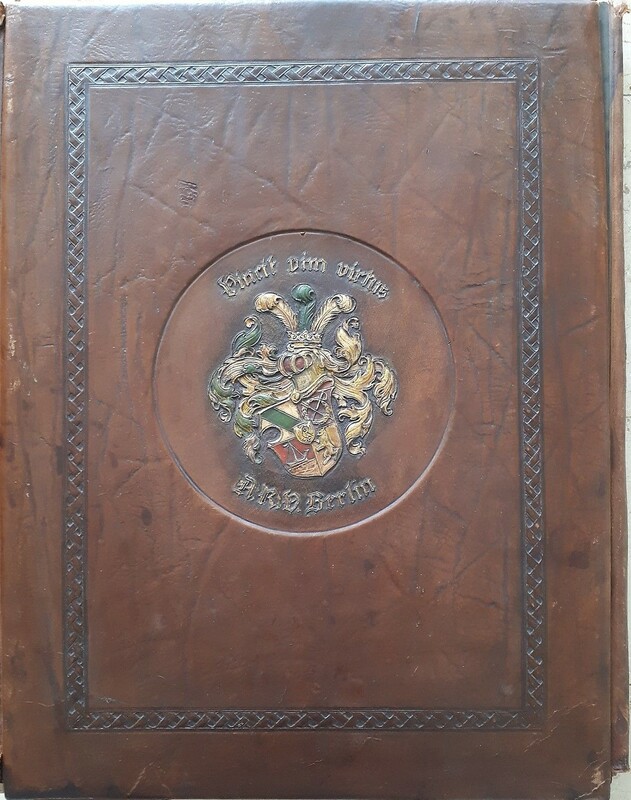 A leather bound photograph album dating from 1912 bearing the coat and arms of the Berlin Students’ Rowing Club. The crest shows the club’s colours in the upper left section, a boat in the lower left section, the bear, as Berlin’s heraldic animal, and an oak wreath with a crossed oar and sabre. The latter symbolises the club’s principle to grant satisfaction (see the article on German fraternity traditions here). The coat of arms is topped with the club’s Latin motto “vincit vim virtus” (virtue will prevail over force/violence), a motto applicable to both society and the sport of rowing. 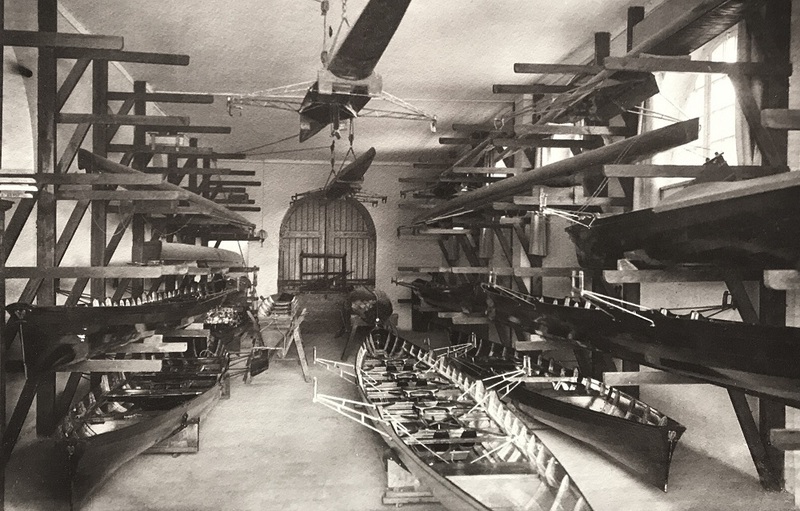 Stephan Ploke, president of the Akademischer Ruderverbindung Westfalen, writes on a rediscovered piece of German rowing history. The rowing community is indeed a global village – a few days after Tim Koch had published his article “The Grosse Wiener – and Ruder Things”, which featured a picture of a victorious crew from ARV zu Berlin which was taken from a German illustrated magazine covering the Grünau Regatta of 1912 and which I had never seen before, Tim pointed out to me that he had spotted the original in a photo folder, which was on sale in an antique bookshop in Germany. 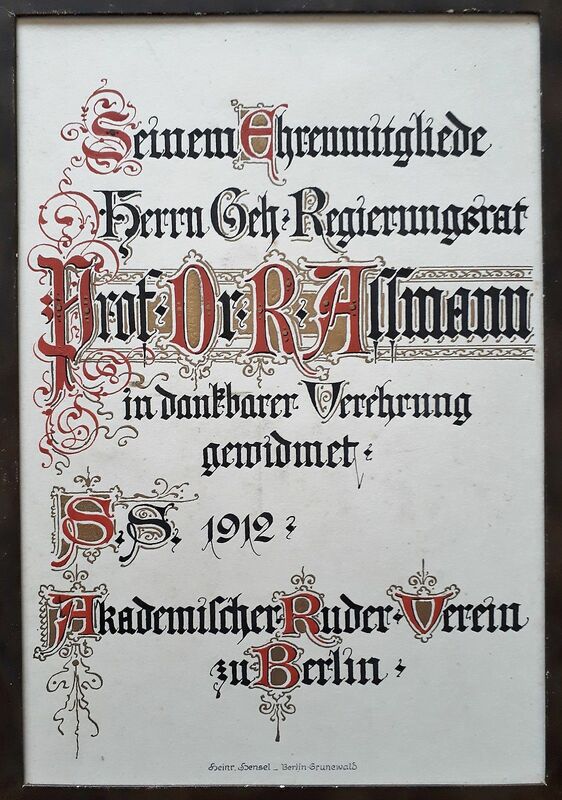 Dedicating such albums was a popular, yet very expensive tradition around the turn of the last century in richer clubs and fraternities in Germany, and these albums are extremely rare to find nowadays. As my club, the Akademische Ruderbindung Westfalen in Münster, considers itself the Lord Privy Seal of the German Academic Rowing Clubs, it was immediately clear that we had to purchase the album in spite of its proud price of €1,600 (£1,390/$1,800). After a quick call for donations, I had collected the respective funds and some days later I was holding the huge album (which is almost two feet tall!) in my hands. The Akademischer Ruderverein Berlin (ARV Berlin) was founded on 29 June 1891 as a student rowing club and was originally located in Stralau, a borough east of the historic city centre of Berlin. 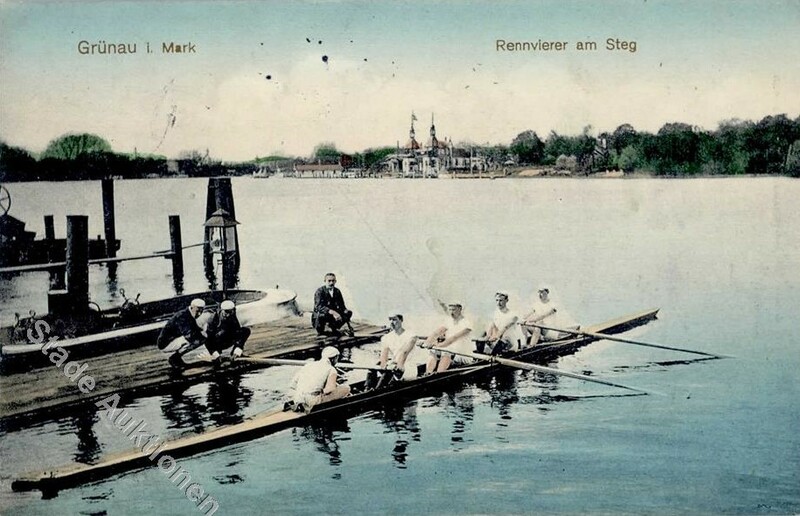 In 1903, the club moved to the Berlin suburb of Grünau, where the regatta of the 1936 Olympic Games was held. 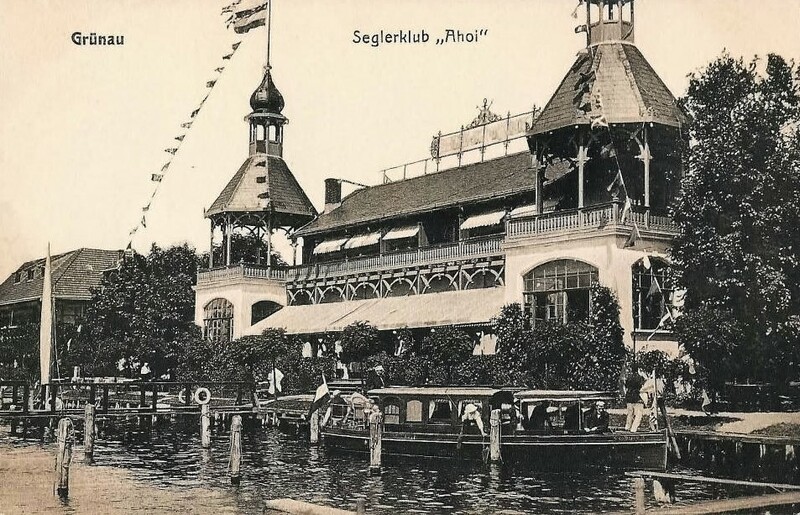 The following article seeks to illustrate both the club’s early years and to provide an overview of the watersports scene in Grünau with the help of selected pictures from the album and a couple of contemporary postcards. Whilst briefly alluding to some boathouses in the close vicinity, I assume the numerous boathouses and regatta buildings along the Grünau regatta course would be well worth a dedicated article. The first page of the album is a dedication to the club’s honorary member Privy Council Professor Doctor Richard Assmann in 1912. Richard Assmann was a renowned meteorologist and invented a psychrometer for the accurate measurement of atmospheric humidity and temperature free of any distortions by wind or solar radiation which is still used today. 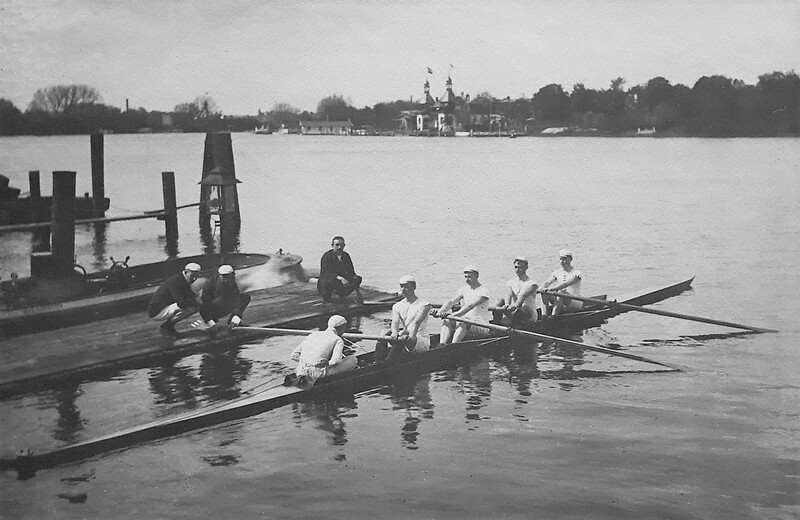 Assmann was also a committed member of the Berlin Regatta Association and drew Kaiser Wilhelm’s attention to the young student cub, which resulted in his support for the club’s new boathouse, as well as in the establishment of the “Akademischer Kaiservierer” Race, an event that was open to university crews only. In 1903, the Akademischer Ruderverein Berlin built this boathouse in Grünau. The total costs for the new building amounted to 80,000 Marks, this at a time when a racing four cost 500 Marks, an exorbitant sum for a club that was merely 12 years old! The project could only be realised thanks to significant donations out of Kaiser Wilhelm’s own pocket and from Julius Martius, the director of the Berlin photo and film company Agfa, who was rewarded with a noble title in return. 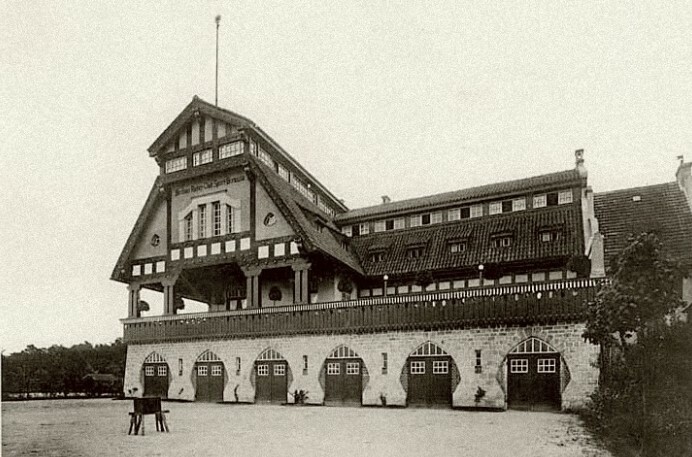 The new boathouse for the Berlin club, Sport Borussia, built in 1906 next to that of ARV Berlin. 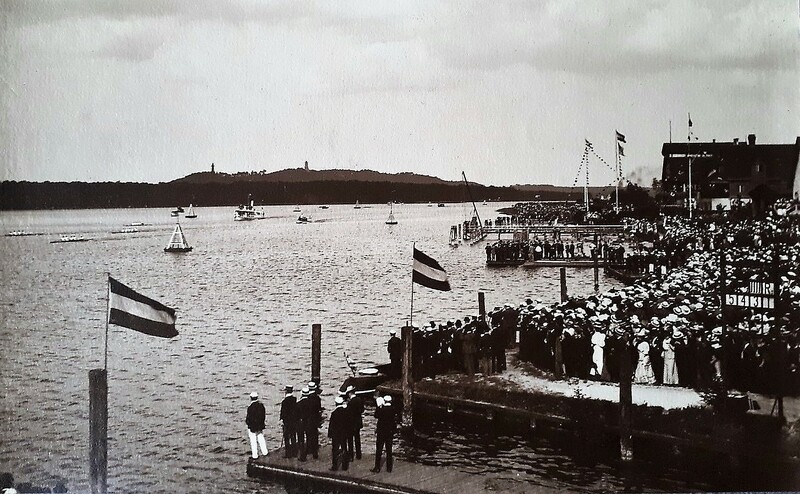 During a visit at the regatta in Grünau, Kaiser Wilhelm II stated that boathouse shall stand next to boathouse on the shore of the river Dahme along the regatta course. Hence he dedicated the land to be exclusively used by water sports clubs and his vision soon became true – in 1906, Sport Borussia moved into their new home, which was even bigger than the ARV house, and about half a dozen other boathouses followed in the next years. Sport Borussia won the German Championships in the eights in 1921 and 1924 and in the coxless fours in 1923 and 1925 as well as multiple other medals in these years and was one of the dominant clubs in German rowing in the 1920s. After the war, Sport Borussia merged with Berliner Ruderverein 1878, which is located in West Berlin. 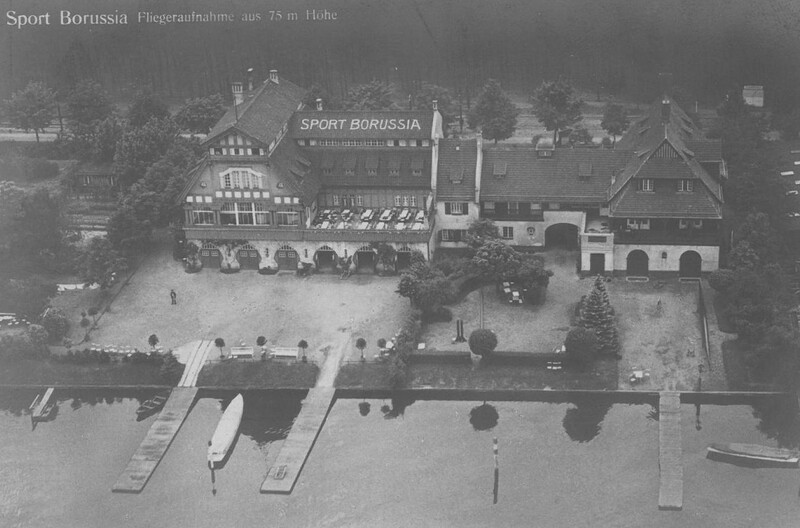 A postcard from the 1920s showing an aerial view of the boathouses of both Sport Borussia and of ARV Berlin. 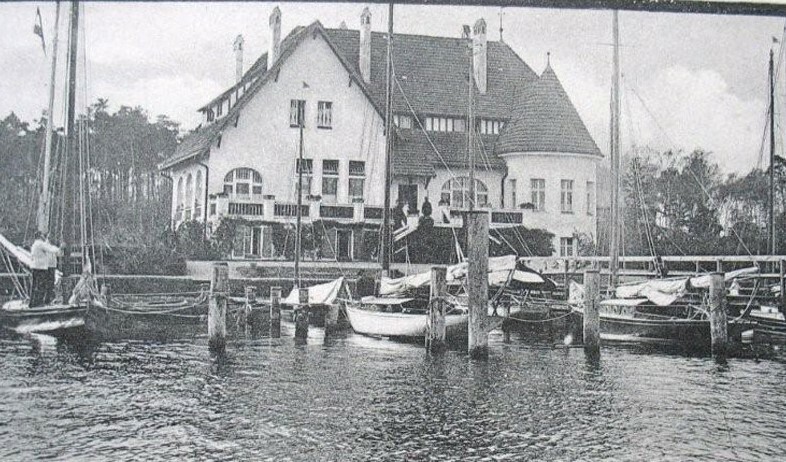 On the plot on the right next to ARV Berlin, the Berlin Sailors’ Club constructed the next building in the Grünau row of boathouses. Today, it is owned by a canoe club. 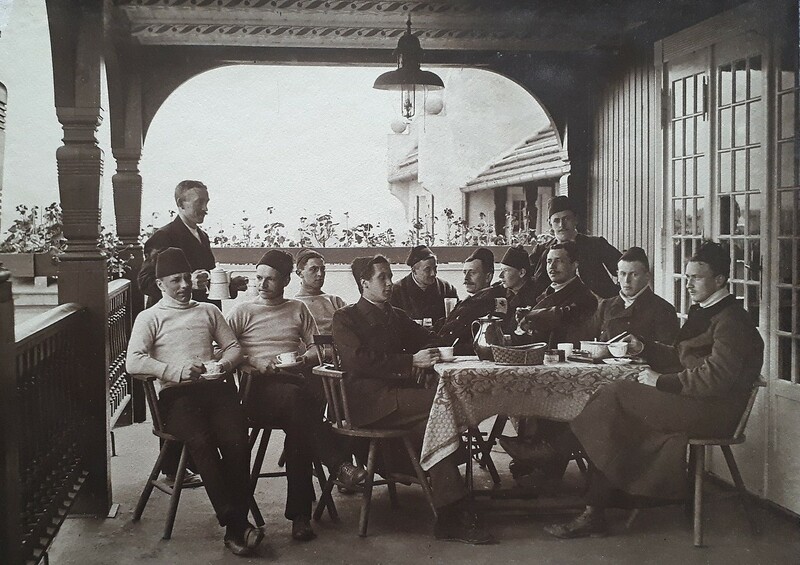 Drinking coffee on the ARV Berlin boathouse veranda in 1912. The peculiar caps worn in the picture above look like fezzes, but they have no specific tradition in German academic rowing. I believe it was simply a “fun picture”, they were very popular at that time. For the 1936 Olympic Games, when the regatta was held just in front of the boathouse of ARV, the veranda was closed with windows to provide enough inside space for all members and their guests in case of typical German weather (and according to the book The Boys in the Boat, it was actually a very chilly summer that year)! 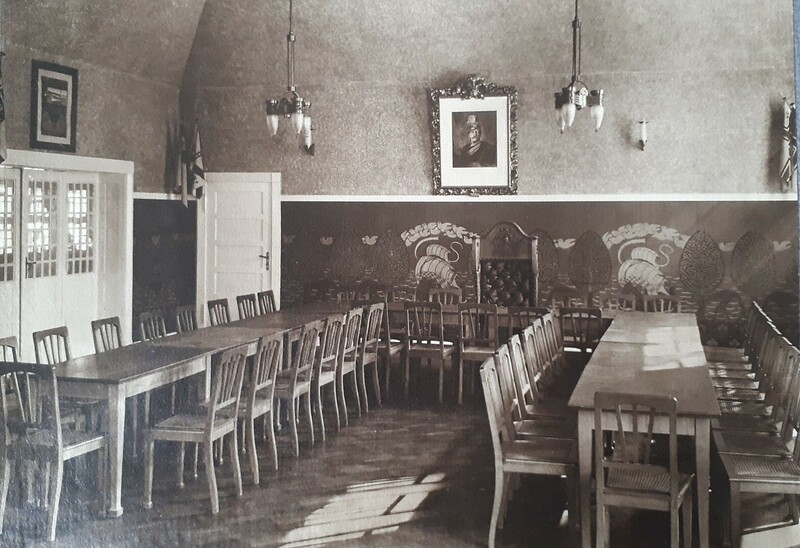 The ‘Kneipsaal’, the main social room of the ARV Berlin boathouse, where Kneipen (see here for an explanation) and other social events were held. As the above shows, the interior of the ARV Berlin boathouse was mainly styled in the rather plain version of German Art Nouveau, particularly reflected by the lamps and wallpapers showing the typical cogs used by the Hanseatic Union. The Kaiser manifested his great affection for water sports in general and for the young ARV in particular by dedicating a signed portrait of himself, an honour that was only bestowed on ARV Berlin and his own fraternity, Corps Borussia Bonn. The billiards room on the first floor adjacent to the ‘Kneipsaal’. The room also hosted a rather peculiar regatta prize – a “saw” from a sawfish with a silver badge showing the engraved regatta records. 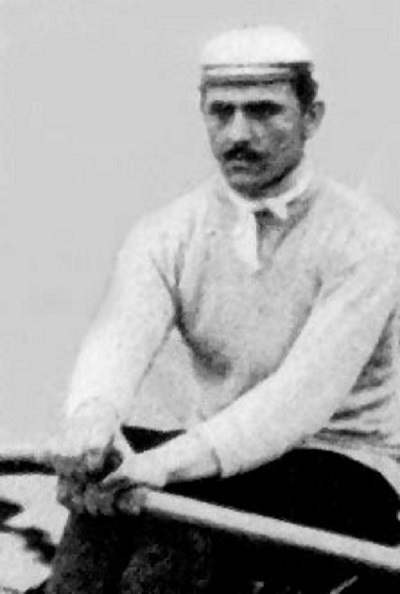 The club’s most successful rower, Berthold Küttner, who was the German vice-champion in the singles in 1895 and, together with Alfred Jaeger, the German representative at the 1896 Olympics in Athens (see here for their story). A coxed-four at the club’s landing dock, the coach’s steam launch is moored on the other side. The above picture was apparently colourised later and published as a postcard. The impressive structure in the background is the boathouse of the Saling Club Ahoi. As many other clubs situated in the eastern part of the divided city, the club moved to West Berlin and is located on the Wannsee today. 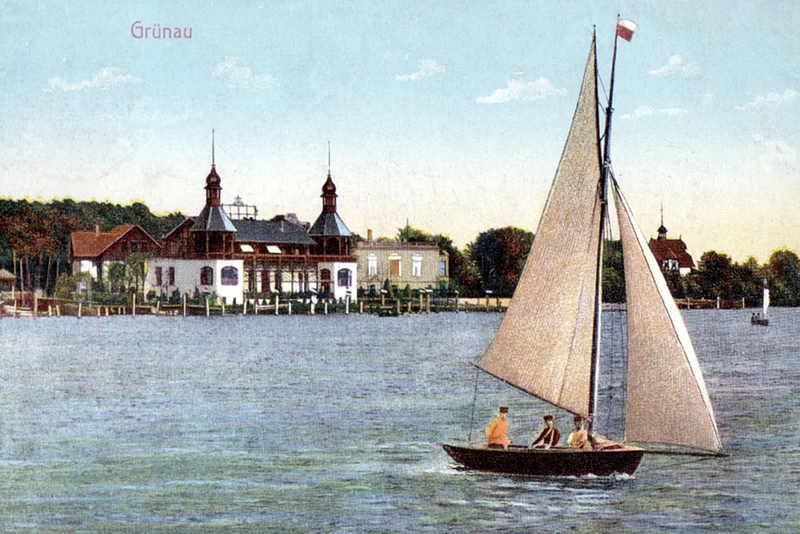 Two postcards of the Sailing Club Ahoi from 1892. 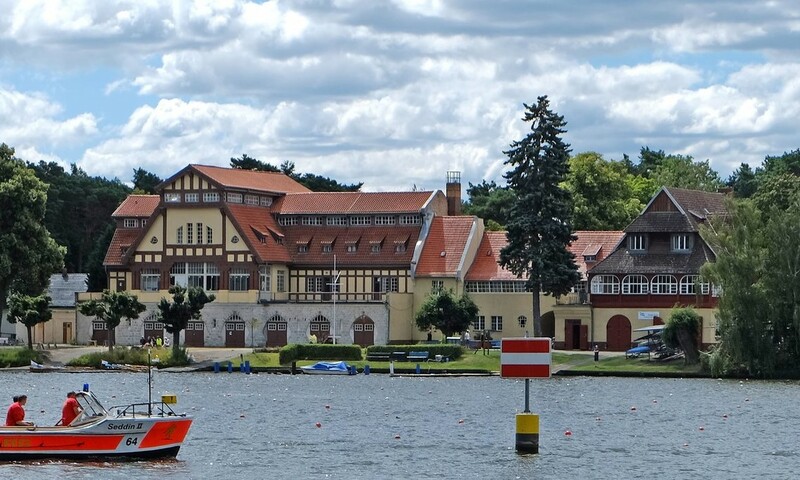 The Sailing Club Ahoi was situated on the banks of the river Dahme in Grünau, just on the finishing line of the regatta course, and can also be seen on the famous picture of the finish of the eights race at the 1936 Olympics. 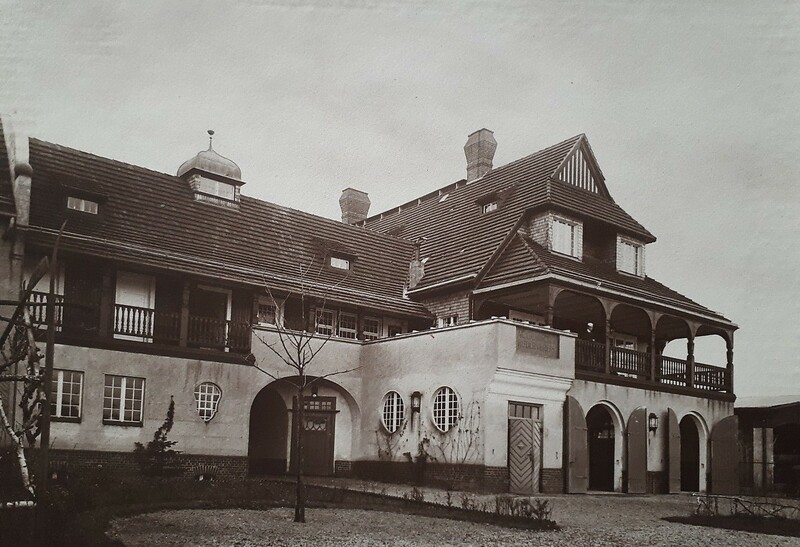 The splendid house survived the war, but lost its two little towers over time and is home to the Yacht club ‘Wendenschloß’ today. The race for the Akademischer Kaiservierer. 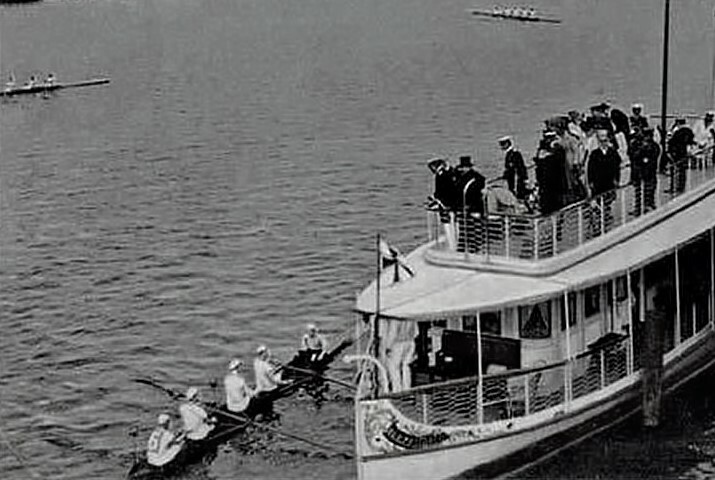 The race was followed by the Kaiser in this royal yacht Alexandria and the victorious crew would moor at the yacht and receive the trophy from the Kaiser’s hands. This picture was shot near the finish line of the race course and the boathouses of ARV and Sport Borussia are visible in the background. The victorious crew mooring at the “Alexandria”. The Emperor was an enthusiastic supporter of watersports, and his and his family’s personal attendance made Grünau the most prestigious and important rowing regatta in Germany at that time. Similarly, he was a keen sailor and likewise supported the ‘Kieler Woche’, the annual sailing regatta in Kiel and the Kieler Yacht-Club, which are still the dominant institutions in German sailing nowadays. The picture that triggered it all: Victorious crew at the ‘Akademischer Kaiservierer’ race. 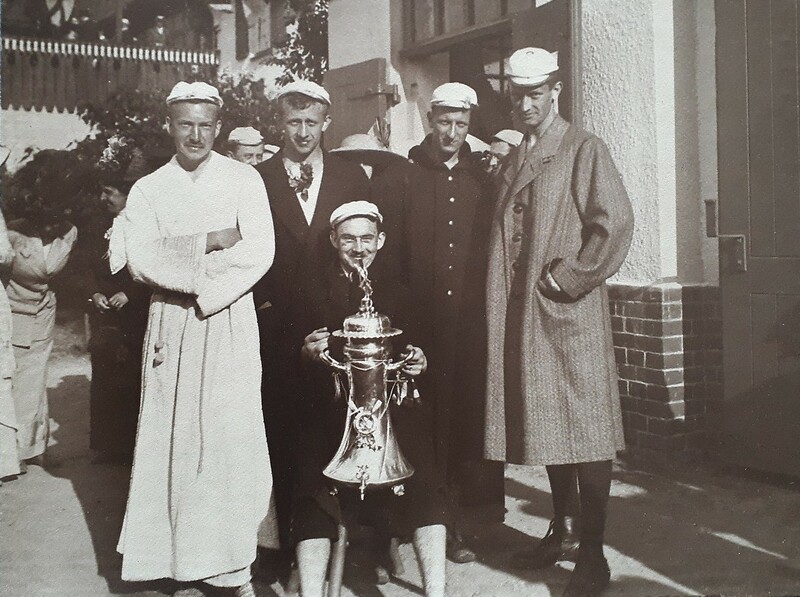 The trophy got lost in the commotion after the German defeat in World War II, but we are still wondering about the gown of the left rower – possibly only an elaborate bathrobe as it appears to have been cold that day, but certainly not a peculiar style of a Rowing Blazer. 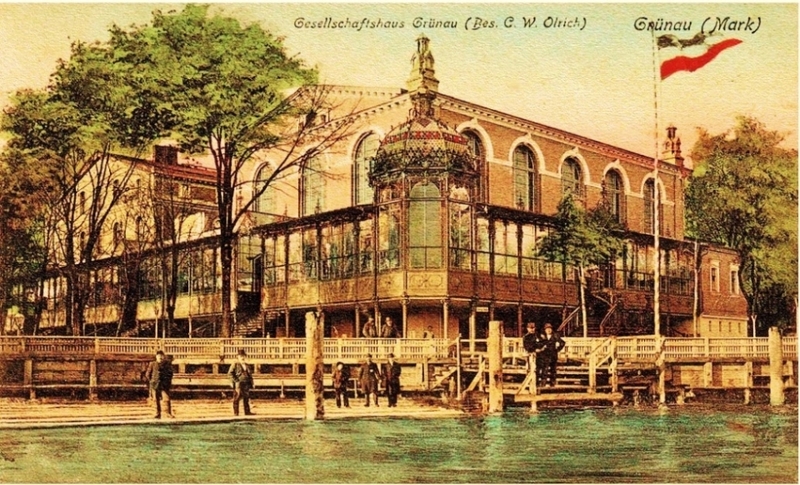 (The two above postcards) The so-called ‘Gesellschaftshaus’ was situated not far from the finish line and was a complex comprising restaurants, hotel rooms and a large ballroom hence providing infrastructure for regatta visitors. However, the building was not only used during regattas but also as a destination for the ever popular weekend excursions in Germany. The complex still stands today but is currently empty and sadly falling apart, but plans to convert it into a home for elderly people are currently under discussion. 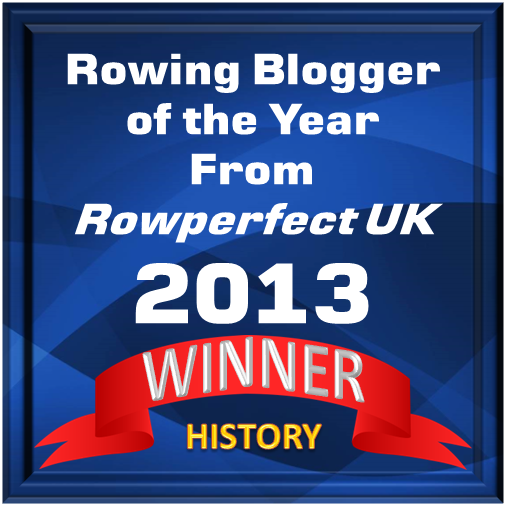 As described in several articles on HTBS before, touring is a quintessential part of German rowing culture. The German love for nature and being outside was additionally fuelled by the “Lebensreform” movement which arose as a reaction to the continuous industrialisation and urbanisation and hence proposed a nature-oriented lifestyle. 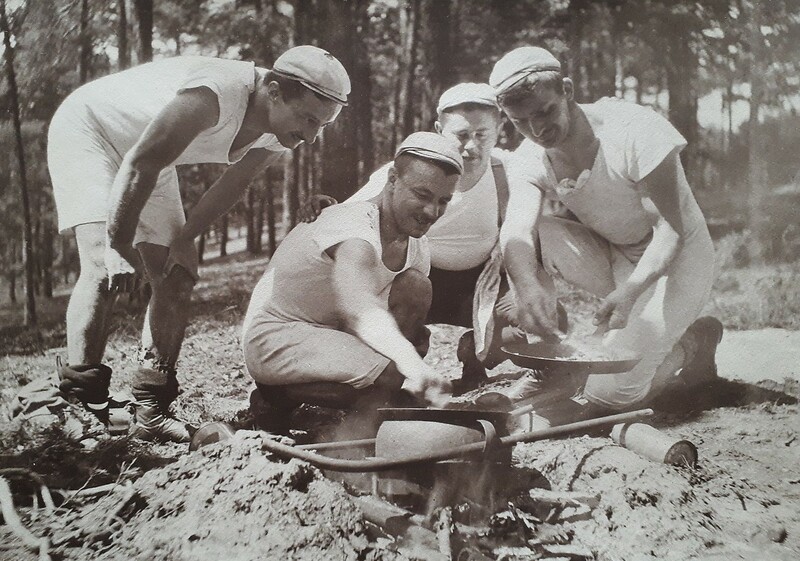 Hence, particularly before the World War II, it was very common to sleep in tents carried in the boats and to cook your own meals on an open fire. At the end of the boathouse row in Grünau, at the 1000-metre-marker of the regatta course, the so-called water sports memorial was built in 1896. 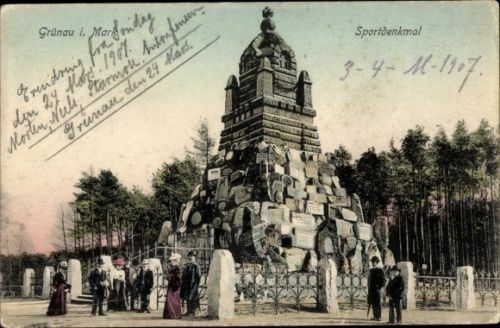 An appeal to contribute stones with respective club names carved-in was sent to all German water sports clubs and more than 300 clubs send their stones to Berlin, which were then used to build the memorial. 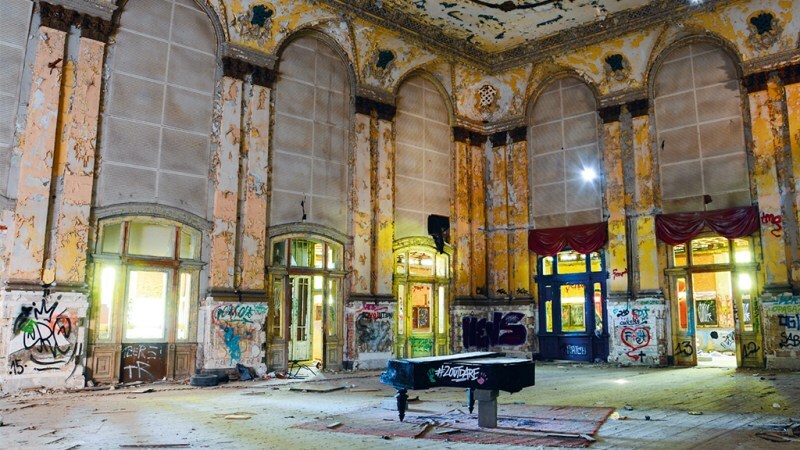 It was torn down in 1973 in the preparations for the World Youth Games in 1973, as a relic from Prussian times did not fit the ideology of East Germany’s communist rulers. After the Berlin Wall came down, several stones were found and were brought to the water sports museum in Grünau. The boathouses of ARV Berlin and Sport Borussia as they stand today. The former is rented by the club, Turbine Grünau, the latter is used as a training centre for unemployed craftsmen. Wonderful. Can you please pen another article about ARV Berlin today?